This account offers both detailed explorations of the epistemological, metaphysical and ethical themes that continue to stand at the forefront of philosophy, and to voice a critical attitude to the historiography behind this emphasis in philosophical thought. At the same time there is due sensitivity to historical context with particular emphasis on the connections between philosophy, science, and theology. 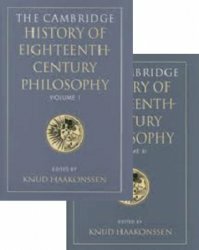 This judiciously balanced, systematic, and comprehensive account of the whole of Western philosophy in the period will be an invaluable resource for philosophers, intellectual historians, theologians, political theorists, historians of science and literary scholars.